Thanks for your emails after our last newsletter! Glad to see how much people enjoyed it and especially the kick everyone got out of our link to the "trick pony." Sometimes we just have to have something brighten our day! Steve and I just returned from the Deep Run Shows ) and I think that summer is finally here :-). I have to hand it to the riders. It's hard enough to get out there and perform well anytime, let alone when the temperatures creep towards the 100 degree mark! But the showgrounds are lovely and the hospitality superb! A very well run show with a large number of vendors, lots of food and plenty of ice and snow cones to go around! Steve's plein air oils (that's french for something like "painted outside from life") that he paints while at the shows have really taken off. He creates beautiful watercolor portraits, but his little oils of the show rings, grandstands, oak trees, etc. seem to have touched a chord with the clients. To know more about his paintings, FAQ, and to order one, visit his gallery page. I will be set up with our Fine Art portraits at the NC Hunter Jumper shows at the Hunt Complex in Raleigh NC from June 28-July 2. 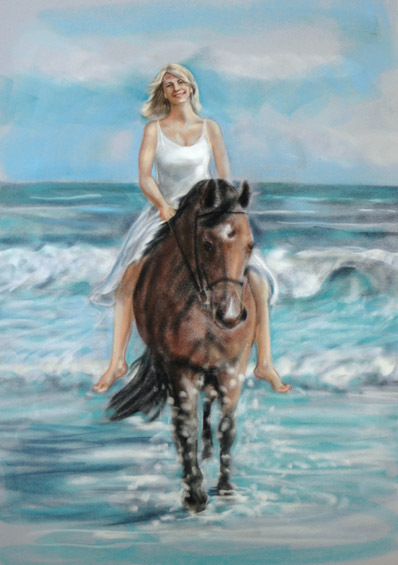 While I am there, Steve will be at the Warrenton Pony Show in Warrenton, VA the same time with his oils. He has several requests from clients to paint specific areas while at the show, so track him down and tell him what you want. He is continuing to create paintings of both the Upperville and Deep Run shows at the moment for people who ordered them, so check with him to see if yours is ready. Fun stuff: OK. Need a fun moment? Take a look at this horse and see if you can figure out what's going on. You would be amazed how many people took a double take before it dawned on them what they were looking at! Especially listen to what a child says! In my next newsletter, I'll show some of the portraits that we have just completed as well as ones that people have asked me about. No, I have not finished that large 4' x 5' oil that I worked on all week in Upperville but it won't be long! We hope everyone has a safe and Happy 4th of July! And we also hope that all the recent rains have not washed anyone away!